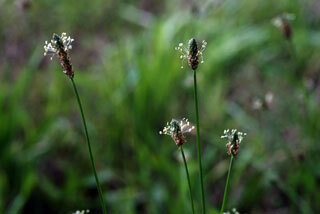 Also Called: European plantain, ribgrass. Leaves: Basal; blades oblanceolate to narrowly elliptic or linear, 3 to 12 inches long, .3 to 1.8 inch wide, margins entire or shallowly serrate, tip acute or attenuate. Inflorescences: Terminal spikes, short-cylindric to conic, 2/5 to 2 inches; bracts ovate-acuminate, 0.8 to 1 times as long as calyx; peduncles strigose or hirsutulous. Flowers: Calyx 4-lobed, lobes ovate, 1/12 to 1/10 inch, upper 2 united; corolla semi-transparent but sometimes appearing white, tubular, 4-lobed, lobes 1/12 to 1/10 inch, spreading; stamens 4. Fruits: Capsules ellipsoid, 1/8 to 1/6; seeds 2, golden brown to blackish, boat-shaped, 1/12 to 1/8 inch. Uses: This species has been used medicinally for a variety of ailments since ancient time. Dioscorides and Pliny (1st century) reported its use by soothsayers and as a love charm; and a tea made of its leaves and seeds was reputed to alleviate hemorrhoids, fever, cramps, stomach and liver troubles, headaches, asthma, toothaches, earaches, whooping cough, diarrhea, wounds, and poisonous snake and insect bites.